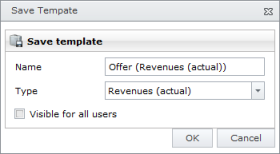 On the Budget Position tab, in the Template group click Save Template. Choose a budget type in the Type drop-down list. Select Visible for all users control box, if you wish. The new template is now available under Load Template. For more information see Load a budget template. How to Save a New Budget Template in InLoox PM 7 Web App • Copyright 1999-2019 © InLoox GmbH. Tous droits réservés.